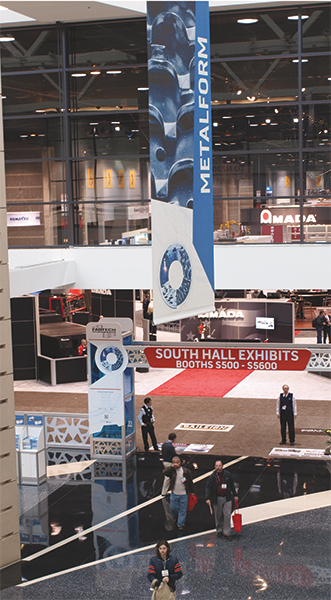 FABTECH 2013, the largest metalforming, fabricating, welding and finishing event in North America, set records last November for numbers of attendees and exhibitors as well as for floor space. More than 40,500 attendees visited 1573 exhibitors spread across 650,000 sq. ft. of exhibits at McCormick Place to see live equipment demonstrations and compare products side-by-side to find cost-saving solutions at product displays. FABTECH attendees and exhibitors in Chicago also raised more than $15,000 for the victims of the severe storms and tornados that devastated Washington, IL, and other areas of the state on November 17th. The five FABTECH co-sponsoring organizations made a financial commitment to start the campaign, with all funds collected going to the American Red Cross to help victims of the storms. 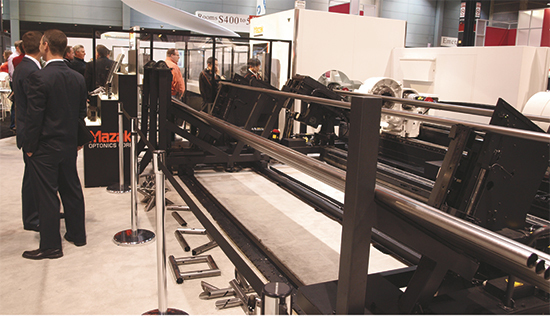 Here is just a small sampling of the new-product introductions spied at FABTECH 2013. Look for more product introductions from FABTECH in future issues of MetalForming, beginning with our waterjet-cutting technology showcase slated for the March issue. The Lincoln Electric Co. Cleveland, OH, introduced its new Power Wave Advanced Module equipped to enable alternating-current (AC) gas-metal-arc welding (GMAW) of aluminum. Fabricators used to gas-tungsten-arc welding (GTAW) of aluminum will find the system to be a nice alternative, we were told by Lincoln officials, as will those welding steel assemblies with large weld-joint gaps. The Advanced Module reduces burnthrough and optimizes wire-feed speed and oxide cleaning. Its high-frequency starting mode (for GTAW) can be controlled at the wire feeder or power-source user interface. Mazak Optonics Corp., Elgin, IL, demonstrated for FABTECH attendees its new Tube Gear 2D laser-cutting machine with high-speed capabilities for thin-walled applications. Available with a 2.5- or 4-kW resonator, the machine can process round and rectangular tube and pipe to 6-in. dia. It has a standard 5-in. servo focus torch and can make cuts at a rapid traverse rate to 6300 in./min. A triple-chuck fixturing system minimizes warp and material vibration, allowing for high-accuracy and high-speed processing of material to 21 in. long. Its ability to firmly grasp the workpiece material enables rotation speeds to 160 RPM during cutting. And, a bundle material-load/unload system allows for increased throughput for large lot sizes weighing as much as 4.2 tons. 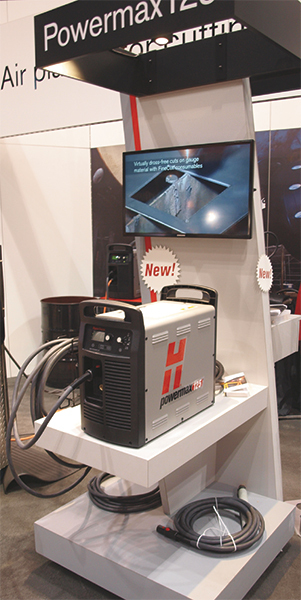 Hypertherm, Hanover, NH, used the FABTECH stage to launch the Powermax125, a new plasma-cutting and gouging system capable of cutting 1.5-in.-thick steel at speeds to 18 in./min., with capacity to 2.25 in. When gouging, the power supply enables material removal at 27 lb./hr. Hypertherm estimates consumables for the Powermax125 will last up to four times longer than previous models in this amperage range. It offers specially designed consumables for drag cutting, gouging, thin-gauge cutting and automated cutting. The Powermax125 comes standard with Hypertherm’s Smart Sense technology, which automatically sets air pressure for optimum cutting and gouging performance, and turns off power to the torch when the electrode is used up. 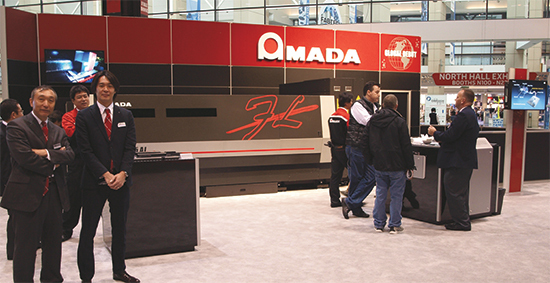 Fiber-laser manufacturer JDSU, Milpitas, CA, partnered with Amada to introduce to FABTECH attendees Amada’s Ensis-3015AJ 2-kw fiber laser that performs like a 4-kw machine. Amada personnel explained that the machine is designed to cut thick (to 35 mm) and thin work simply by changing the beam configuration electronically. With previous cutting systems, a condenser lens had to be manually changed in order to adjust the beam configuration to cut different types of materials. This versatility reportedly results from the advanced fiber-laser design co-developed by JDSU and Amada. 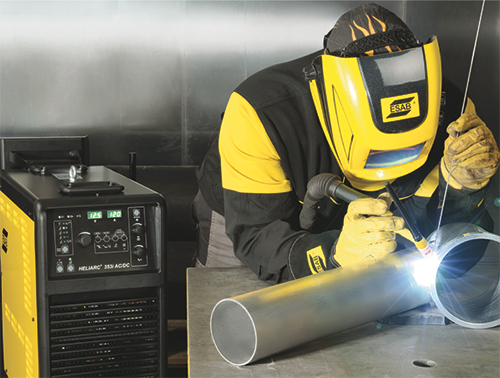 ESAB Welding & Cutting Products introduced its new trio of Heliarc inverter-based power supplies for AC/DC GTAW and SMAW welding. Touted is the easy-to-achieve optimized arc settings that enable an operator to weld aluminum using a pointed tungsten, improving arc starts and minimizing heat input. Heliarc’s fast-switching AC process removes the need for high frequency (used for arc starting) during welding, reducing electrical noise and the risk of interference to surrounding electronics. AC frequency control focuses the arc for narrow weld beads and faster travel speed. Used to power AC pulsed GTAW, fabricators will find the machine ideal for welding thin aluminum. The product family comprises the Heliarc 281i, a 280-A unit for single-phase connections; the Heliarc 283i, a 280-A unit for three-phase connections; and the Heliarc 353i, a 350-A three-phase unit. Mate Precision Tooling, Anoka, MN, demonstrated its new VariBend flexible, multipurpose CNC punch-press tool designed for forming smaller piece parts where using a press brake seems like overkill. Use it to form tabs at any angle to 90 deg. The upper forming tool is lowered onto the sheet until bending begins. Then, the flange is overbent to account for material springback. As the upper tool returns, the desired bend is formed. Although not required, VariBend is well suited for machines with upforming capabilities and especially for machines with stroke control. 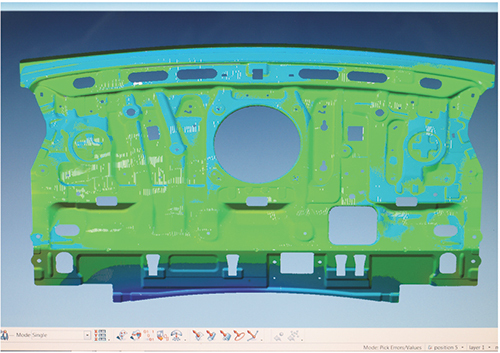 Upforming allows the highest form possible for the tool design. Since the die sits lower than a forming die in a normal forming operation, the sheet lies flatter. This increases dimensional accuracy while keeping sheet marking on the bottom side of the sheet. Cubitron II abrasive products, with 3M precision-shaped grain, aggressively cut through more material, faster. These long-lasting products, displayed at the 3M Abrasives booth, require less pressure, which helps to reduce operator fatigue. Use the wheels for beveling, scale removal and weld leveling. 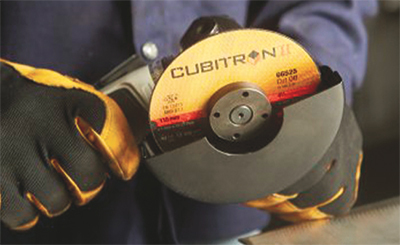 Loaded with extra abrasive material for extra-long life, Cubitron II flap discs 967A prove ideal for a wide range of jobs around the shop, including one-step grinding and finishing, weld blending and deburring. Also available: 3M Cubitron II grinding and sanding belts and abrasive discs. 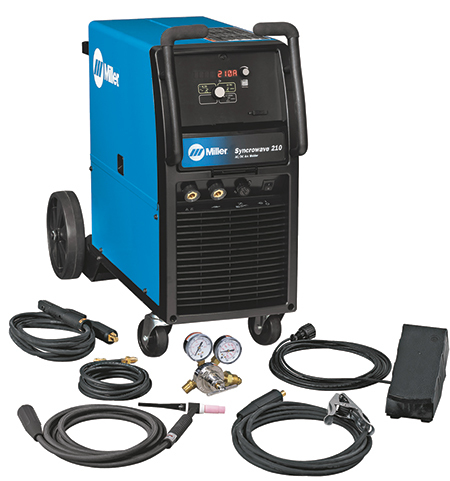 Built for light-industrial applications, automotive repair and personal users, the new inverter-based Syncrowave 210 TIG welder displayed by Miller Electric Mfg. Co. can single-pass weld material as thick as ¼ in. in a single pass. The machine also marks the debut of Miller’s Pro-Set feature, which takes the guesswork out of weld-parameter setting by offering preset controls designed by Miller weld engineers. Users simply select either the DIG or Balance feature and adjust until Pro-Set appears on the display. The machine draws less power than the previous Syncrowave 200 model, allowing full welding output from 230 V while drawing less than 30 A. The result is lower installation and operational costs. Among numerous product innovations displayed at the Trumpf booth was the debut of BrightLine nozzle technology, which accelerates the cutting gas to a high velocity and, using a finely tuned set of parameters, enables cutting of stainless steel to 0.8 in. thick. The setup also proves ideal for cutting highly reflective materials such as copper and aluminum alloys. As explained by Trumpf engineers at the booth, fabricators also can use the BrightLine nozzle to cut smaller contours than previously possible. And, small holes which previously could only be drilled now can be cut with a laser. Other benefits: spatter-free piercing, and a smooth cut surface and wider kerf to ease part removal from the skeleton. FABTECH 2013 in Chicago set the tone for the upcoming year of international programming by FABTECH’s sponsoring partners. FABTECH Canada runs March 18-20, 2014 at the Toronto Congress Centre. On April 10-12, the inaugural FABTECH India, collocated with the India Institute of Welding’s Weld India Exhibition, lands in New Delhi. FABTECH Mexico takes place at the Centro Banamex in Mexico City, May 6-8. And, last but not least, FABTECH 2014 heads south to Atlanta, GA, November 11-13. Learn more at www.fabtechexpo.com. See also: 3M Abrasive Systems Division, Lincoln Electric Co., Mazak Optonics Corporation, Hypertherm, Inc., Amada North America, Inc, ESAB Welding & Cutting, Mate Precision Tooling, Miller Electric Mfg. Co., TRUMPF Inc. In this sense he has a incredibly actual connection with the ancestors of Northern Irish Protestant who came to Ireland from Britain bringing new farming methods, constructing roads and towns and schools. I've been absent for some time, but now I remember why I used to love this site. Thanks, I'll try and check back more frequently. How frequently you update your website?